The Friends of the GWTs is an all volunteer group that depends on the assistance of many to keep the trails clean and promote concerns about protecting the trails and trail users. Please help us by publicizing this webpage www.friendsofthegreatwesterntrails.com and post it in news articles or on your webpages too. Thanks! Starting at 9:00AM* - Rain or Shine! *9:00AM is the approx. start time. Times set by the local coordinators. Or send an email to Voluntary Chairperson, Don Kirchenberg to email address: frndsgrtwstntrl@aol.com or call 630-853-7650. The trails are cleaned year around by volunteers. Your help in keeping the trails clean is appreciated. Please remove all drink containers and snack wrappers you take with you on the trails. Thank you. Why must the annual cleanups be Rain or Shine events? 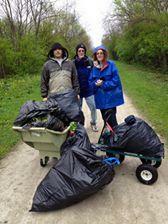 Many people ask why does the trail cleanup need to be a "rain or shine" event? The facts are that the towns, townships and counties that the trails run through schedule their highway work crews and equipment to pick up the amazing amount of trash we pick up. The Monday after the cleanup they use their dump trucks and crews usually assigned to road maintenance and landscaping to picking up the trail trash. when picking up trash along the trails. Thanks for your interest in the trails. We definitely need volunteers along the GWTs all year around. Be careful out there so you can enjoy the trails year around. Here are some basic suggestions to help make the cleanup safer. 1. We suggest that you wear gloves, long sleeve shirts and long pants to protect you from thorny bushes and/or broken glass along the trails. 2. Take a wagon or cart to haul the filled trash bags out to the closest trash can. 3. Please do not leave the filled bags along the trails. 4. If you want to recycle bottles and cans you pick up you'll have to separate them and take them to your home or local recycling bin. The local authorities and waste pickup companies do not accomodate recycling along the trails. Unless you see a recycling container do not assume it will be recycled. 5. Be careful and if you see something too big or hazardous to pick up. Please advise us of the approximate location like north side of trail 1/4 mile east of the closest cross street. With that information we can get the appropriate authorities with the appropriate equipment to safely remove the items dumped along the trails. Send us an email to frndsgrtwstntrl@aol.com. Volunteers cleaning up the trails is the essence of the spirit that started the Friends of the Great Western Trails over 10 years ago as an all volunteer group (and we remain unpaid volunteers) without any memberships or big bank accounts like other groups. If you were on the GWT in Sycamore on 8/14/16 maybe you saw something related to this case. Please read the article linked below FYI. SYCAMORE – DeKalb County Sheriff Roger Scott knows the public has not forgotten. People regularly approach him and ask about it. Thank You to the Sycamore Singles (2 volunteers from the group in photo) for their ongoing support of our annual trail cleanups! THANK YOU to the Mooring family! Anyone that has enjoyed the IL Prairie Path and the Great Western Trails owes the Mooring family a debt of gratitude. Having volunteered alongside the Moorings their energy, dedication and vision was always an inspiration to do more. Thank you to them for fighting and working on the IPP which helped us get it extended. And all the other trails benefited because their work helped make the IPP a success and model for others. One of the driving forces behind the Illinois Prairie Path, F. Paul Mooring of Glen Ellyn, is being remembered this week as a physicist and lifelong environmentalist. Trail cleanup volunteers from the Lions Club in DuPage County returned again this year and did a great job on an over one mile long stretch of the GWT. Thank you to everyone from the Friends of the Great Western Trails. Special thanks to Sue Crosson - Knutson for coordinating the cleanup with the Lions. 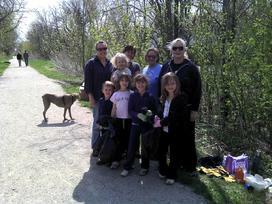 2014 GWT cleanup volunteers from St. Matthew's and the Green party of DuPage County. At Swift Rd and the GWT in Lombard, IL. The cleanup was a success! THANK YOU! Thank you to the volunteers from the Green Party of DuPage County for their ongoing support of the annual trails cleanup! served the citizens in and around Lombard, IL! 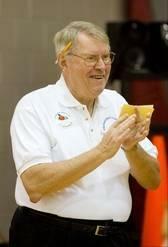 Mayor Mueller always had a smile and kind word for anyone. As the volunteer President of the IL Prairie Path for several years or as the ongoing voluntary Chairman of the Friends of the Great Western Trails I enjoyed many conversations with the Mayor. If you had a concern or if you wanted to work to help correct a problem like the "tree butchering" (a term I heard him say first) on the trails he would ask how he could help. The trails and trail users all benefited from his sincere concern to improve the quality of life for residents and visitors to Lombard. For his dedication and work he deserves a lot of recognition (he would not want any accolades) maybe we can name the bridges that are being built on the Great Western Trail through Lombard in his honor? With the passing of West Chicago's Mayor Mike Kwasman http://www.dailyherald.com/article/20120417/news/704179666/ our community (not just West Chicago) lost a dedicated elected official and the environment lost a good friend. 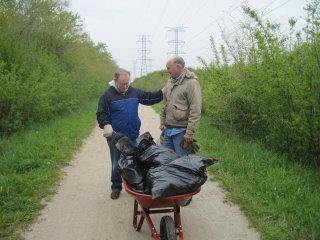 Many years ago when we started to expand the trail cleanups on the Great Western Trail and IL Prairie Path he was an Alderman in West Chicago. He would give us immediate feedback and provide the trail groups with important resources to haul away the amazing amount of trash we collect every year. As Mayor he also took action and directed an effort to help trail supporters fight Com Ed's butchering of the trees on the trails. He also lead the City of West Chicago to pass a resolution requesting the first ever public forum on tree maintenance which the Governor's office, ICC and DuPage County Chairman later supported. My best wishes go out to his family, friends and coworkers. Mayor Mike Kwasman from the City of West Chicago website. The Boy Scouts from St. Charles Troop 80 worked hard and had a great time cleaning up the Great Western Trail on Saturday 4/28. They found some interesting trash and discovered that there are some runners/bikers who like a certain brand of energy-boosting supplement that they like to drink and toss in the bushes when they are on the path! Thank you to the scouts, parents and supporting agencies! In the group photo on the right from left to right-back row: Grant Rose, Charlie Smith (his hat is just visible), Landon Rose, Matt Ferarro, Austin rose, Sam George, Susan George, Dave George; Front row: Grant Workman, Chance Rose, Gary Smith and Peter Ferarro. David George is the Scout Master. 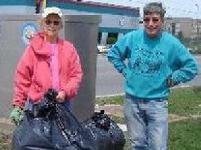 Linda Smith provided the photos and helped coordinate their participation in the cleanup. Some of the volunteers that came out for the annual all volunteer GWT cleanup on 4/28/12 you see: Pete Null, Gary Tomlinson, Dave Barry, Richard Dunn and Christy Barry. Note the pile of bags in this photo should be multiplied by three because they drop filled bags at the 3 streets that cross the GWT in their section which are Bloomingdale, Presidents and Schmale Rd. 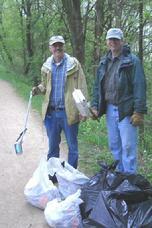 Two long time and dedicated trail supporters Dave Barry and Richard Dunn participating in the trails cleanup. NOTE: All groups from any political viewpoint or religion are always welcome to participate in the annual trails cleanup. Please mark your calendars now for the last Saturday in April for the probable date of the annual cleanup. 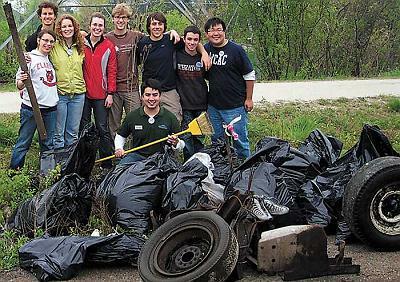 If you have a group that wants to "officially clean" a section of the trails let us know so we may help you get started. The annual trails cleanups can be fun for the whole family or a group event especially when you see a clean trail after you finish! the IL Prairie Path and trails that connect to both. Thank you to all that assisted with the cleanups! and feel free to forward a link to this website. Click on the PDF logo to get a copy of the two page trail cleanup flyer that includes trail maps. to the closest cross street. Unfortunately, by a vote of 27 to 29, on the first week of February 2012 the U.S. House of Representatives Transportation and Infrastructure Committee voted down the bipartisan Petri/Johnson/Lipinski amendment that would have fixed many of the deficiencies in the House transportation bill, particularly as they relate to the Transportation Enhancements and Safe Routes to School programs. The amendment would have also restored eligibility of rail-trails. But all is not lost. The many thousands of you who contacted your representatives during the past few days about this amendment made a strong and powerful statement that Americans from all across the country want, need and deserve more trails and walking and bicycling opportunities. Thank you again for all of your actions, time and energy! #1 In DuPage County This early spring-like weather has driven many people out of their houses and onto the trails. However, the mild winter and lack of hard freezing this summer has actually been detrimental to the trail surfaces in various segments of the county. Trucks that typically performed winter work on frozen surfaces instead encountered soft edges of the trail and created ruts. Bikes and horses also rutted the soft trail surfaces. Typically, we repair and resurface the trail in the late spring or early summer, after all of the thawing of snow and after spring has ended and trail surfaces become more firm. In March, our maintenance crews are still performing their “winter tasks” which typically do not include trail maintenance. As a matter of fact, much of the trail repair equipment is still in winter storage. However, due to the odd weather and trail conditions, they will be addressing trail surface repairs in the upcoming weeks. The Division of Transportation is extracting and tuning up our trail maintenance equipment because we want to make the trail environment as safe as possible. However, until then, please ride carefully as there may be some uneven surfaces on the trail that cannot be addressed immediately. #2 Com Ed and its tree maintenance contractors have begun tree "trimming" on the trails. Please keep an eye out and let us know what you see. The new Trail Coordinator for DuPage County Dan Thomas has been very helpful so let us know what you see and we can begin to get some corrective action taken (if needed) sooner with his assistance. Contact us at email address frndsgrtwstntrl@aol.com and send over any photos if there are problems with "tree butchering!" See copies of photos and news articles below regarding past problems with tree trimming along the trails. Feel free to post it on your webpages and/or in newsletters. 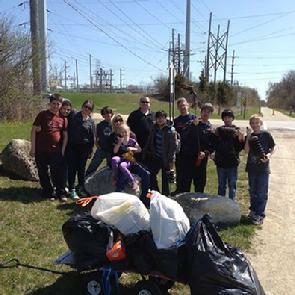 Not everyone finds this much trash but the first time volunteers from Wheaton College lead by long time trail supporter Ben Lowe (with the broom) cleaned up a busy and dirty one mile long section of the GWT in the Carol Stream/Winfield area. THANKS again to everyone! Bringing a wagon or two wheel dolly helps make the chore easier when bringing the filled trash bags to the nearest cross street that intersects with the trail. Thank you to the 2 volunteers from the group of Elmhurst Bicycle Club volunteers that come out every year to clean the GWT. Rain or shine our volunteers come through! 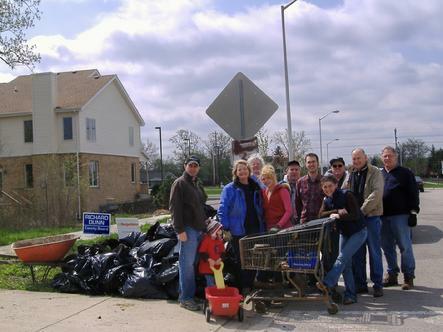 Members of the Bloomingdale Lions Club, Glendale Heights Lions Club, and the Bloomingdale Westfield Middle School Leo Club have cleaned their adopted one mile of the trail from Prince Crossing Road east to County Farm Road in West Chicago for many years. Thank you again to the Lions Clubs for all that they do to help our communities. The Friends of the GWTs is an ALL volunteer group without any budget or membership fees. Unlike other groups with many thousands of dollars in the bank we simply roll up our sleeves to maintain the trails and contribute what is needed to help publicize our cleanups and concerns. THANK YOU again to all the volunteers from the Girl Scouts of DuPage County shown in this photo. Thank you to all the GWT cleanup volunteers in Kane County including Jon Copper, Don Jonas and Tom Bloore that is taking the photo! has some nice rides in Iowa. built by the Conservation Corps. Boy Scout Troop 202 from Lombard, IL. as the sun is setting. Thank you to Eagle Scout candidate and Boy Scout Matt Chlebeck for all his work on the Great Western Trail in DuPage County! He worked hard during the summer and fall of 2011 to get all the mile markers cleaned up and repainted with a safety yellow color and placed fresh mulch around each pole. He also had to replace the missing 8 mile marker pole. His family (parents Mary and John) and members of Troop 202 from Lombard all helped Matt complete this safety project that improves the use of the trail for everyone. And thanks to Bruce Blake with the Boy Scouts and Dan Thomas with DuPage County who helped facilitate all the arrangements to make this project happen. 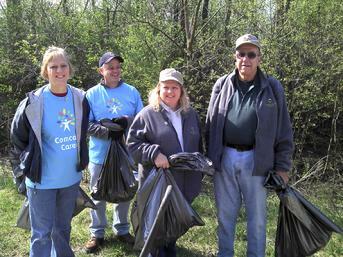 For the 2011 all volunteer cleanup of the trails we were very lucky to have dozens of Comcast employees out to clean a very long, busy and dirty section of the GWT in DuPage County! The photo (click on the link below) shows the dozens of filled garbage bags and assorted items they pulled off the trail and sides of the trail between Swift Rd and Main St. in Glen Ellyn and unincorporated Glen Ellyn, IL. Thank you again to Comcast and their employees because as the sign in the photo says Comcast Cares! 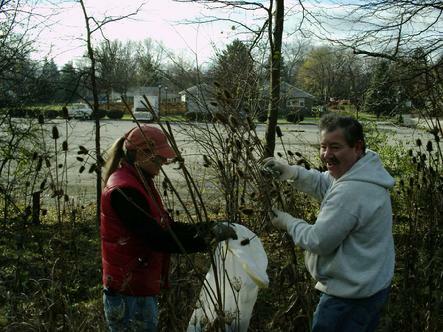 A few of the dozens of Comcast employees that came out for the 2011 cleanup of the GWTs! Click on the link to the left to see the results of their hard work. The annual trail cleanups are successful because of volunteers like David Gorman who has helped clean the trails for many years. 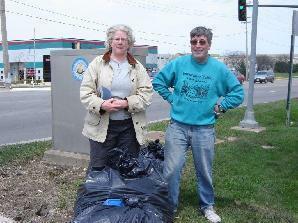 Recently he has done an excellent job coordinating the cleanup of both the GWT and IPP within the Village of Lombard. 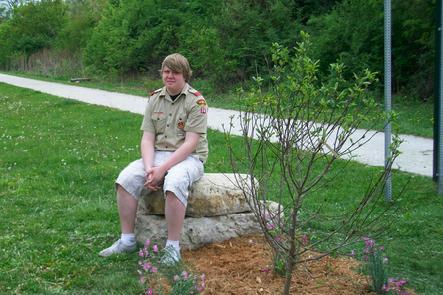 In 2011 he coordinated approximately 150 volunteers on both trails from Comcast, Healthy Lombard, Glenbard East Key Club, the Glenbard East Ecology Club, Calvary Episcopal Church, Midwestern University Kappa Psi Fraternity, NYK Line Inc., Westmore School 1st Grade Reading Club, Boy Scout Troop 202, Cub Scout Pack 48, the Lombard Jaycees and the Deicke Home. Many individual residents also helped out. GWT cleanup volunteers in 2011 included employees from the NYK Line. Thanks again to David, the Village of Lombard and of course all those that took the time to make the trails cleaner and safer for the rest of us! 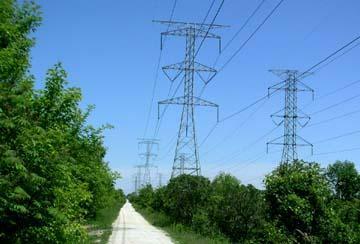 This photo exemplifies the majority of the trail in DuPage Cty from the west, tall bushes and short trees on both sides of the trail and following the high-voltage power corridor. The surface is crushed limestone and is suitable for road bikes. An overpass carries the trail over I-355 and there is an underpass at Rte 53 but most other road crossings are unprotected and care must be taken on several of them, notably County Farm, Gary, and Schmale. As you approach the east terminus in Villa Park, you encounter more residences and industrial areas, but there are far fewer residential street crossings than found on the nearby Illinois Prairie Path which runs through the heart of several suburbs. and the ongoing efforts to improve our environment. 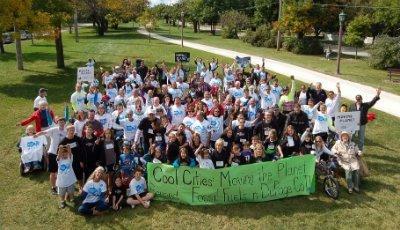 Many of the participants in the 2011 event stayed for a photograph taken along the Il Prairie Path in Villa Park, IL Click on the photo to get more info. 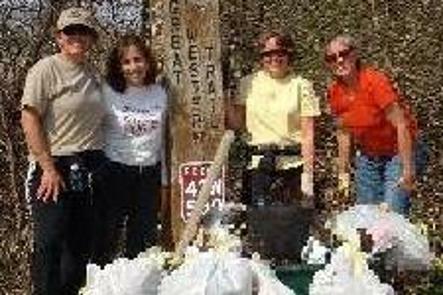 The Friends of the GWTs is an all volunteer group that depends on the assistance of many to keep the trails clean and promote concerns about protecting the trails and trail users. Thank you to all our volunteers. The Friends of the GWTs supports the proposed lighting of the GWT through the Village of Lombard. Attached is a letter of support regarding the project. With assurances from the consulting firm involved with the project that the lights would be directed away from private property especially any nearby homes we wholeheartedly support this proposed improvement. Photo of the GWT crossing the busy UP tracks in Lombard from Sun publications. Click on photo to get the caption and news article. There are many trail and street routes to enjoy. Here is one that includes the GWT in DuPage County. Click on the photo to learn more. reaches Lombard, it has a spot that becomes very dangerous,� We agree! GWT on the south side of the tracks and St Charles Rd. been quick to follow-up on trail concerns for his support of the GWT bridge project. GWT back open in Lily Lake! especially glad to have the trail back in service and know it will get a lot of use,� she said. the section with asphalt this summer. Great Western Trail, visit the recreation section at kaneforest.com. of the embankment. There is a 22-foot drop where the destroyed culvert is being removed. district's Web site at www.kaneforest.com. Join us on Facebook! Click on the logo to get to the page to sign up. Enjoy the scenery and watch out for the wild life along the trails! Enjoy the Prairie Fever Outdoor report by clicking on the photo. Click on the photo to get more photos and a travel report on the GWT in Iowa. Eagle Scout candidate Tyler Durgan from Boy Scout Troop 34 Wheaton, IL admiring the work he completed with the assistance of many volunteers and the support of the Kiwanis Club of Central DuPage and the Friends of the Great Western Trails. Click on the PDF logo to get a copy of the press release Thanking Tyler Durgan and the Kiwanis Club of Central DuPage. Durgan Eagle Scout project volunteers after the job is done. Boy Scout Troop 34 volunteers working with Eagle Scout candidate Tyler Durgan on his GWT improvement project at Bloomingdale Rd. in Glendale Hts, IL. Thank you to the many volunteers from the Elmhurst Bicycle Club, trail users/neighbors and hundreds of others that help every year to keep the trails clean! We need your help year around to keep the trails clean. 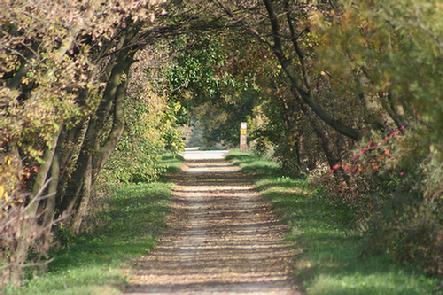 Enjoy some trails off the Great Western Trail in DuPage County immediately west of I -355 at Swift Road. WATCH OUT for fast vehicles on Swift Road! Here is an overview of the GWT in DuPage County that also shows the major cross streets and the IPP. On your way to/from the trails please bike defensively to avoid cars! This excellent article from the Chicago Tribune details 10 basic ways to ride your bicycle defensively: http://articles.chicagotribune.com/2010-08-16/health/ct-x-c-cycling-safety--0818-20100816_1_crosswalk-slam-drivers-bicyclists-and-motorists Click on the link above to learn these important safety ideas! Please pass it on. Thanks and be safe. www.saferoadways.net has a lot of good info and links to issues related to the trails and safer travels for folks wanting to travel without having to get behind a steering wheel. 2 pedestrians have been killed attempting to cross North Ave/Rte 64 since it has been expanded to several lanes wide without crosswalks at most intersections. Thank you to the always dedicated volunteers from the Elmhurst Bicycle Club. Trail cleanup volunteers Dave Barry and Jim Haggerty stopping to discuss issues about the Great Western Trails with an unidentified trail user. Photo taken by trail cleanup volunteer Karl Gabbey. Green Party volunteers cleaning up the GWT! pickup all the trash we collect in one day! Follow us on Facebook and join as a fan too. Click on the logo to learn more or simply type in Friends of the Great Western Trails in the search window the next time you are in Facebook! See the attached letter to the Sheriff of DuPage County about a very dangerous site found during the annual trails cleanup on 4/24/10 along the Great Western Trail. We need your help in watching for illegal activities and structures along our trails. The Friends of the Great Western Trails supports the Carol Stream bicyclists efforts to improve safety on the GWT! will take them up on their suggestion for safety improvements at a busy intersection. to stop before finishing crossing the road. said Robert Guico, who heads up the Carol Stream Bikes organization. He said the traffic there seems to comes in clusters. Fagan said she received the organization�s letter. �(That intersection) has been on our list to take a look at for several years,� she said. and walkers who regularly submit suggestions for improving the area�s trail systems. �Sometimes it�s just a quick e-mail that says, �Hey, I saw a problem here,�� she said. Path, which is in the right-of-way of the former Chicago, Aurora, and Elgin Railway. are all welcome on the trails. Guico hopes to get more people interested in the Carol Stream Bikes organization. at 421 N County Farm Rd, Wheaton, IL. Kirchenberg concluded "The public forum was the success we hoped for simply because dozens of citizens were able to attend a meeting to air their grievances about Com Ed and the collective governments failure to control Com Ed's tree maintenance practices. Credit goes to many for making the meeting happen and getting us to this point. make brush cuts more aesthetic in the future. Thanks again to Governor Quinn's office and staff for their assistance in getting the 12/14/09 meeting with Com Ed and the ICC which got us this public forum. Additional credit goes to many including Chairman Robert Schillerstrom, DuPage County Board members Rita Gonzalez (District 1), Dirk Enger (District 6) and Tony Michelassi (District 5) for making the public forum happen and getting us to this point. The need of DuPage County residents to relish the paths developed for their enjoyment, and their right to have the lights on when they need them, shared the stage at a public forum Tuesday night in Wheaton. Official minutes of the first ever public forum held in the State of Illinois regarding Com Ed's butchering and killing of the trees. It would have been nice to have the contenet of the statements made by citizens but Com Ed, ICC and DuPage County officials in attendance heard our concerns first hand at this forum. Click on the PDF logo to get a copy of the one page press release on the first ever public forum about Com Ed's tree butchering. Please print a copies of the one page flyer detailing the first ever public forum and why everyone should be attending on 1/12. magnificent colonnades along its streets. Use this one page flyer to advise others of the community's ongoing efforts to protect the trees everywhere and stop Com Ed from spraying herbicides and clearcutting the trees, bushes and wildlife habitats on 4 miles of our trails in DuPage County. Please make copies and distribute them. Also post them on bulletin boards too but NOT on public or private property without permission. to agree to plans to trim tree everywhere including the trails in a healthy manner. in a healthy manner and set that standard. 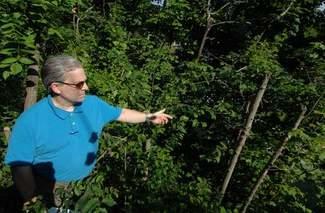 of the trees everywhere along with plans to clear cut and spray herbicides along our trails. 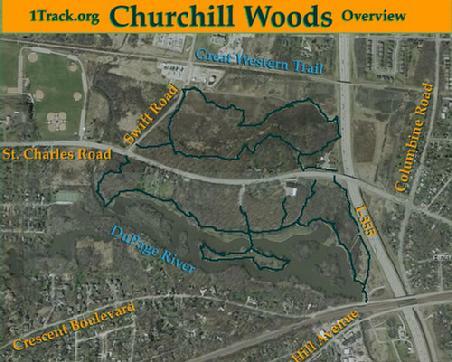 to clear cut trees and spray herbicides along the trails in DuPage County. These are appropriate today and should still be answered over 7.5 years later. by a government agency? What documentation has been given that trees along IPP and other trails have caused outages? And if so, what types of trees are the causes of the problem? What is the cost/benefit analysis of the proposed vegetation maintenance plan over Com Ed's current practices? Have similar vegetation removal programs been enacted in other areas, and have these projects been deemed successful by the utility and the public? What were the lessons learned? What impartial agency or group endorses the types of vegetation control proposed by Com Ed? When is this program proposed to begin, and what portions of the year will this program be executed? What days of the week and time of day will tree removal and spraying occurs? How will the County provide impartial and objective oversight with Com Ed and their subcontractors? What criteria have been set to determine if these tests are successful? What time lines will be followed to measure these tests against the set criteria? When will the County schedule a follow up hearing to determine whether the project was a success? How will Commonwealth Edison guarantee that preferred species, and species currently supporting wildlife (trees with nests), will be saved? 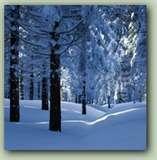 There is discussion of planting 6" to 18" tall replacement trees. Will Com Ed commit to this replanting, and on what scale? What is the expected rate of mortality? If this rate is exceeded, are there any further plans for replacement? Who will maintain these replacement trees? How long will it take before new trees grow to the maturity as replacements? Many of the areas to be impacted by the tree removal plan are on slopes. The soils on these slopes are prone to erosion. What steps will be taken to ensure these slopes are protected from erosion? What are the exact herbicides that Commonwealth Edison and its subcontractors plan to use, and what are the potential health risks to humans, the ecology, and the environment associated with each herbicide? What is an acceptable level of exposure, and how will the contractor ensure this acceptable exposure is not exceeded? What is the contractor's liability for unintended damage to human health, wildlife, vegetation, if problems result in any way or arise out of its herbicide application program? If undue damage is caused, how will Com Ed ameliorate the damage? How will the contractor ensure that soil, groundwater and surface waters will not be contaminated? How close to residential homes and parks will the spraying take place, and will residents be given advance notice? Until these questions have been answered, we cannot support the �vegetation management plan� proposed by Com Ed and DuPage County. Bob Mueller a candidate for State Representative in District 47 has made a statement about Com Ed, the trees and trails. �We need better representation in District 47 to protect our environment and prevent further damage to our recreational areas. I encourage everyone to speak up and ask our current legislators to act now. I encourage everyone who wants to protect these areas from expedient tree maintenance that only benefits Com Ed to file a complaint with the ICC at http://www.icc.illinois.gov/consumer/complaint/wizard.aspx.� concluded Bob Mueller. See his statement and complaint to the ICC in the WORD doc link above. Jim Speta, a lifelong environmentalist and supporter of Parks, Forest Preserves, and Trail Systems is now candidate for the position of State Representative in the 47th District. The trails in Du Page County and surrounding Counties provide a unique place for many people to experience nature and to enjoy a hike close to home. Currently the trail system is 92 miles long and averages 10 feet wide which makes it available to many more people than the usual block park. Jim Speta stated that �I support the ongoing efforts by trail groups like the Friends of the Great Western Trails to work with Com Ed and Asplundh Tree Maintenance Company to enhance the Native Landscaping of prairies and woodlands that are part of these trails. Have you visited the east end of the GWT in DuPage County? trail heading from the east through the section in Villa Park, IL. videos about the GWT and trails across the Chicago area. Thank you to Trails Illinois for posting the video. 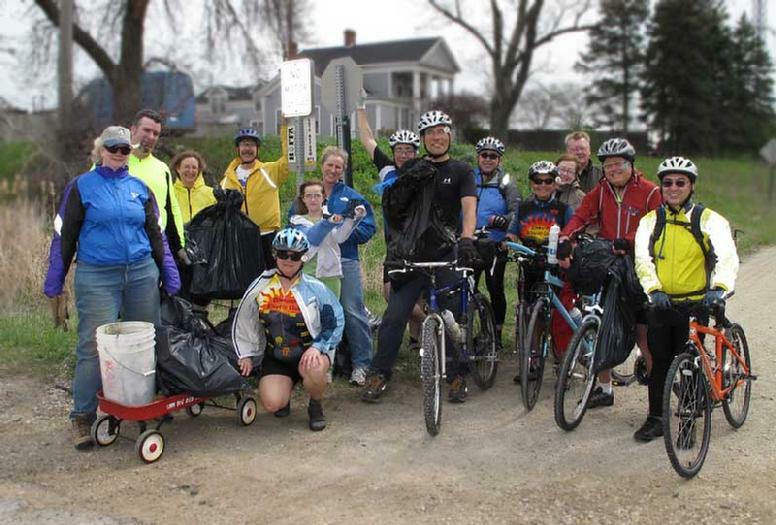 IL TRAIL Group News for 2011! which we now know depends upon regular outdoor physical activity. and trail experiences into Illinois work, play, life. Thank you to all the volunteers that help maintain the GWTs and related trails all year around! Here is a blog that is maintained by trail and tree huggers. Click on the photo to go to the blog. People ask us all the time about alternatives to using Com Ed. Click on the photo to learn more about generating power with wind and/or hydrogen. the spraying of herbicides along the IPP and GWT. made by Com Ed and DuPage County in a meeting in late March, 2002.
our trails by Com Ed. The board of directors has many concerns regarding the proposed plan. Com Ed asserts that tree removal is necessary. Is Com Ed required to do this by a government agency? What documentation has been given that trees along IPP and other trails have caused outages? And if so, what types of trees are the causes of the problem? When is this program proposed to begin, and what portions of the year will this program be executed? What days of the week and time of day will tree removal and spraying occur? What criteria has been set to determine if these tests are successful? What time lines will be followed to measure these tests against the set criteria? Until these questions have been answered, we cannot support the Vegetation management plan proposed by Com Ed and DuPage County. so the newspapers can contact you to confirm you wrote the letter. They will not publish the phone number. See more letters posted below. when we lose 6 trees and get 1 in return? and ensure that trees are trimmed in a healthy manner, as required by the ICC. elected officials at the county and state levels. them to pass similar proclamations. Great Western Trail and use herbicides to stop them from growing. such a large area of heavily populated and used trails is unprecedented. be fed with a bottle, and is given nutrients and fluids through a gastric tube. colds and flus could severely impact his health. impact of spraying these herbicides. PADS, the Kiwanis and local churches. all of us. We are lucky to have them in and active in our community. When you see them be sure to say Thanks! and clearcut miles of trees on our trails. be implemented over several years to help hold down costs. planned spraying of herbicides on the Great Western Trail and Prairie Path. trail neighbors be protected from the spraying of the chemicals?" Commission about these important matters." Here is another example of when Richard Dunn spoke up and changes were made. again to Richard for his time and attention to these important matters. Tom Grimston is right "This issue will not go away!" Com Ed - vs. - the People of DuPage Co. Defendants are accused of wanting Healthy Natural looking trails. How do you plea? Guilty as charged. small tokens, like disclaiming restitutions of the past. for 750 designated tree replacements along county trails. and for that matter electrical consumers of DuPage. parties to resolve this issue, to no avail. and city government for I.C.C. intervention. This issue will not go away. Letters to the Editor have an impact. I am writing to express my concern about the use of herbicides to kill trees and bushes along the Illinois Prairie Path and Great Western Trails. Many of these substances have been linked to higher rates of cancer, autism, and asthma. A simple search at the National Cancer Institute's Web site at www.cancer.gov/search/cancer_literature/ or at PubMed at www.ncbi.nlm.nih.gov/pubmed/ will take you to the primary research. At a time when we have 1 in 150 children diagnosed with autism and increases of childhood leukemia of more than 60 percent in the last 25 years, how can we think the risks are worthwhile? Our beloved daughter, Katherine, died of leukemia we have very good reason to believe was caused by the spraying of chlorpyrifos for mosquitoes, which the company and the city assured us was safe, though we were never warned to take precautions and had no idea of the exposure until it was too late. Hundreds of vulnerable children, pregnant women and others use these paths every day. They deserve not to be unwittingly exposed to toxic chemicals. PLEASE pass along this message. Thanks! THANK YOU to the City of Wheaton including Mayor Michael Gresk, the City Council and the Environmental Improvement Commission for their ongoing support of the community's ongoing efforts to protect the trees and trails from Com Ed and their contractor Asplundh. Please consider asking your elected officials to pass a similar proclamation. 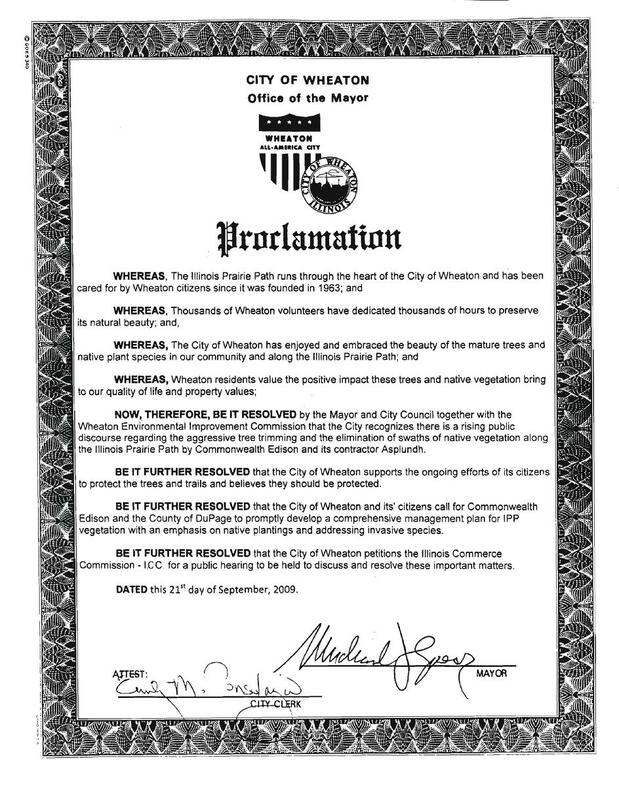 Thank you to Mayor Michael Gresk, the City Council and the Environmental Improvement Commission of the City of Wheaton for their support of our efforts to protect the trees from Com Ed and Asplundh's tree butchering. Concerned citizens are encouraged to contact their state legislators and county officials to voice their opinions about the tree cutting directed by Commonwealth Edison. The state of Illinois has jurisdiction over the tree maintenance practices of all power companies. They can force the IL Commerce Commission to ensure better tree maintenance that will help protect the trees on the trails and anywhere near power lines. And DuPage County officials can stop the use of herbicides to kill trees, bushes and wildlife along the trails. Chicagoans know what happens when Commonwealth Edison crews descend on an area to trim trees and other vegetation they deem a hazard to power lines. All too often, the result is a bunch of deformed trees that look like some Edward Scissorhands disciple on acid had buzzed his way through the yard.But that's a mild description for the latest ComEd blitzkrieg in the leafy northern suburbs of Glencoe, Glenview, Northfield, Northbrook, Skokie and Wilmette. Earlier this summer, Edison tromped out to kill vegetation and trees deemed a safety hazard beneath its towering transmission lines. Did ComEd notify local officials and residents, as common sense would dictate? Nah. Did ComEd carefully prune trees and trim back the lush vegetation that makes the corridor a sanctuary for wildlife? Hardly. ComEd crews dumped gallons of an herbicide called Garlon 3A on low-lying brush over a nearly 6-mile stretch of land the utility owns through those communities. You can't miss this path of destruction: It's 130 feet wide. That's a huge eyesore of brittle, dead brush and other vegetation. It's also a fire hazard, some local fire chiefs worry. The kicker: It could have been much worse. ComEd sent a crew to finish the job in Northfield -- what the village president calls the "epicenter" of the destruction because of ComEd's plans to wipe out evergreens, ash, linden, and spruce that serve as part of Northfield's downtown landscaping. But those trees were too big to be killed with chemicals. So the ComEd crews stopped by Northfield's public works facility to notify the village's forester that they were preparing to start the tree cutting. That's when Stacy Alberts Sigman, the village manager, stepped outside to see what was going on. "I was just stunned," she said. "When you looked down the corridor, as far as your eye could see, it was just dead." She demanded that the work be stopped. And ComEd agreed to a temporary halt. Now ComEd is scrambling to do what it should have done in the first place: Explain to officials and residents why this massive destruction is the best possible solution. They've got a lot of explaining to do. ComEd needs to clear foliage that can interfere with the lines, cause a safety hazard or block access for repair workers, as its spokesman pointed out. But that demands a careful, limited and environmentally sensitive program. As Sigman says: "They don't need an Uzi." No, they don't. It's a blight on these communities -- and on ComEd's reputation. Stacy Sigman, Village Manager of Northfield, stands in the middle of the Com-Ed and Union Pacific corridor amid dead vegetation. The corridor which includes huge power lines and old railroad tracks runs parallel to Happ Road in downtown Northfield. Some weeks back, without warning, Com-Ed sprayed herbicide on the vegetation killing miles and miles of greenery. COM ED destroyed trees and sprayed herbicides WITHOUT ANY WARNINGS along the trails in Northfield and the surrounding communities in Chicago's northern suburbs. See the photo above from the Chicago Tribune news article. As you may have heard and seen on Channel 2 News, the Village recently discovered that ComEd has used a powerful herbicide to destroy vegetation growing under its power lines in the rights of way that run through the middle of Northfield. In fact, they also wiped out vegetation in Northbrook, Glencoe, Glenview, Wilmette and Skokie without permits or notice to any of the Villages. Northfield's Fire Chief as well as the Chiefs in the other communities are concerned about the potential fire hazard the long stretch of dead brush and trees creates during this dry hot season. Of particular concern is what herbacide was used and the close proximity to residential and wetland areas. On Tuesday, August 18, two local representatives of ComEd met with Village Manager Stacy Sigman to let the community know that ComEd wants to work with the Village on this matter and is gathering information to answer questions raised in a letter from President Gougler about the spraying and ComEd's vegetation management program. ComEd also promised not to go forward with removing any additional trees along the right of way. Click here to read the Sunday, August 23 Chicago Tribune article with the Village's comments and concerns on use of the herbicide and the devastation in Northfield and neighboring communities. Pass along this email to anyone that is interested in the trails and trees. Please let us know what you hear back from the officials and/or the ICC. 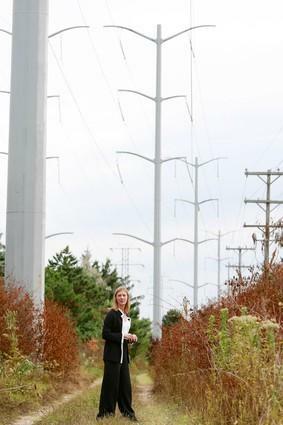 DuPage County Board member Rita Gonzalez, D-Addison, renewed her call Tuesday for an investigation into "poor tree maintenance" by ComEd along the Illinois Prairie Path and suggested increased efforts to draw public input. The District 1 representative is one of many county residents who have complained that the pruning efforts of the utility's contractor, Asplundh Tree Expert Co., have been overly aggressive. The trimming, they allege, has left many old-growth trees lopped off awkwardly, removing far more than necessary in routine trimming around power lines. Gonzalez last month filed a complaint with the Illinois Commerce Commission in which she asked for stricter enforcement of requirements that tree maintenance practices be conducted "in a healthy manner." "I have heard from many residents that want the damage to their trees and property values to stop," said Gonzalez, who encouraged her fellow board members to join the effort. "The ICC has the power to stop this damage." The excessive use of herbicides along the Prairie Path and the adjacent Great Western Trail also must be addressed by the state, she said. According to Gonzalez, some homeowners have lost sections of trees up to 30 feet long that are unlikely ever to grow back. 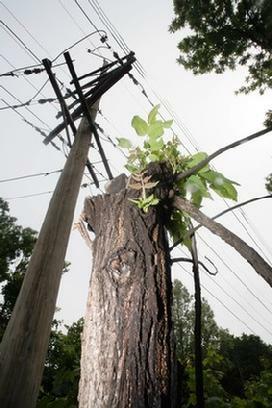 ComEd Senior Vice President Calvin Butler has acknowledged that trees and vegetation are important elements of the trails system, but notes that electrical outages often result from contact between wires and trees. "We firmly believe that providing reliable electricity and sustaining our natural environment can go hand-in-hand. ... Throughout the country many communities have successfully balanced the need for reliable electricity with governmental tree clearance standards and local concern for the environment," Butler wrote in a letter to The Sun earlier this month. ComEd spokesman Peter Pedraza told The Sun that the herbicide program would be limited to three specific areas � one on the Prairie Path and two on the Great Western Trail � and that only conforming chemicals would be used. Licensed professionals would be responsible for applying the herbicides, Pedraza said. Gonzalez has suggested that public meetings about the issue be scheduled during the evening, to enable maximum numbers of interested resident to attend. Please let us know what you hear back from the officials and/or the ICC. Pass along this email to anyone that is interested in the trails and trees. The Friends of the Great Western Trails received emails and phone calls late this week from concerned trail users and neighbors because Com Ed and Asplundh (their contractor) are back on the trails specifically the IL Prairie Path in Glen Ellyn east of Taylor Ave. 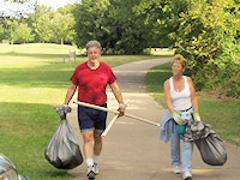 Trail users and neighbors are upset to see Com Ed and Asplundh back out on the trails "working on the trees.". Why is Com Ed & Asplundh working on the trees and trails contrary to promises of prior notice and written plans to be distributed and explained BEFORE more work was performed? I know of 3 different times we were promised prior notice and written plans BEFORE more work was done. #1 At the meeting of DuPage County's ad hoc Trails Committee on 5/19/09 it was agreed by all attending including Chairman Brook McDonald, Debra Olson - DuPage County Board Member (District 4), Deborah Fagan (DuPage County's Trail Coordinator), and representatives from Com Ed including John O'Halloran that no more work would be performed on the trees/trails before everyone was advised of the work and specific plans. #2 Also at a meeting on 6/22/09 with Mr. Voller and Mr. O'Halloran of Com Ed that I attended with Rita Gonzalez -DuPage County Board member (District 1) we were promised a plan in writing detailing Com Ed's future steps before any future work would be performed on the trees and trails. <?xml:namespace prefix = o ns = "urn:schemas-microsoft-com:office:office" /> If there are any questions or you require any additional information, please let me know. Thank you. Note the comment... Further detail will be provided and reviewed with the task force on this approach. SUMMARY: We received three promises to give us notice and a written plan of future work along with a lot of talk of involving the trails groups, users and neighbors to get a plan we all understand and hopefully agree to. So despite the additional promises by DuPage County staff, the Ad Hoc Trails Committee and Com Ed of working to improve communications and making a better effort to engage everyone in solving the problems with the trees and Com Ed/Asplundh's butchering of them, work started again this week and more trees were trampled or removed. People are upset. People should be upset with the past practices and now the continued failure to involve us. With notice from DuPage County, the Ad Hoc Trails Committee and/or Com Ed the Friends of the Great Western Trails and the IL Prairie Path group could have posted information on our websites alerting everyone of this work - whatever it is that is going on. NOTE the DuPage County webpage for the trails www.dupageco.org/bikeways does not have any information posted on it about any work by Com Ed or Asplundh. The Friends of the Great Western Trails are just volunteers (with no membership dues or budget) but we find the necessary resources and the time to communicate with trail users, supporters and neighbors. We will continue to commit the time to get the problems defined and resolved. We now need DuPage County and Com Ed to follow suit and back up their promises. How will you fix these problems of poor communication at best and continued uncontrolled tree/trail maintenance that has resulted in a lot of concern and mistrust about the process and participants? We continue to offer our assistance with this important matter. DuPage County Board Member Rita Gonzalez serving District 1 is asking the tough questions in defense of the trees, trails and trail users. THANK YOU Rita! Rita Gonzalez, Member of the DuPage County Board serving District 1 announced today her concerns about the damage to trees last week along the trails in <?xml:namespace prefix = st1 ns = "urn:schemas-microsoft-com:office:smarttags" />DuPage County by Commonwealth Edison (Com Ed) and its contractor Asplundh. Click here http://www.suburbanchicagonews.com/napervillesun/news/1678347,Pierotti-defends-Blackwell-structure_na072209.article to get a news article from the Sun-Times newspaper group. Watch this space and website for current environmental news. THE PUBLIC CONTINUES TO SPEAK OUT to protect the trees, trails and trail users including the wildlife. 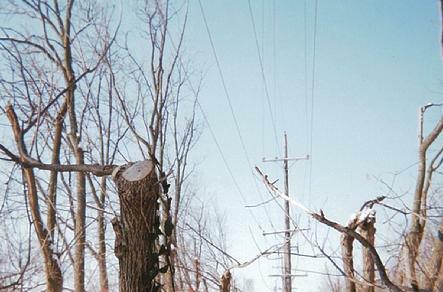 One has only to look at Commonwealth Edison's record, as evidenced by the dire condition of trees near their wires along the Illinois Prairie Path, to know that its claims of "tree hugging" are pure public relations claptrap designed to prevent any positive change in their maintenance policies. Surely we can have both a reliable electricity supply and a healthy and aesthetic trail system that can be used and appreciated by citizens of all ages. thesun@scn1.com add others you would like. about these topics in the newspapers. about the trees and Com Ed. entity that tries to balance the "care"
for the past 10 years" is stretching it a bit. is needed are faces to create a Totem pole. the only thing that matters is the wire. some being taken down after "pruning." with letters written from cushy offices. Nature loving front man, Calvin Butler, Senior V.P., Com Ed, the abysmal stakeholder of the trees they have chopped and hacked along the DuPage Co. trails says �ComEd appreciates the value of (the) wooded communities, the aesthetics (and)�pleasure trees provide�, as what, fire wood?! In a letter from Mr. Butler recently published in the newspapers he has pointed out, storms and tree damage are a major cause of electrical outage. They are discussing a proposal with DuPage Co. to replace the trees along the trails with some native species. This a noble idea and really worthy of Arbor Day recognition, but frankly nothing more then a distraction until Com Ed can prove it really does care for the trees by trimming them in a healthy manner as required by the Il Commerce Commission. Com Ed, fixing the trees along the trails in DuPage County would be great, but it starts with you and your golden opportunity to again lead by example with a qualitative and quantitative restoration and preservation of all the trees. Send us your letters and any other letters you see in the newspapers. We were heartened to see the July 3 Fence Post letter from Calvin Butler, Senior Vice President of Com Ed regarding maintenance along the Great Western Trail. We have long been an advocate for the upkeep and use of these trails, and have been watching the current debate with a great degree of interest. We understand the need for limited and responsible tree timing, and hope we can reach an agreement that will serve the interests of all concerned. - The removal of invasive species of plants and the use of indigenous species to replace them. - The use of glyphosate as the only herbicide used along the trail. You and I would refer to this herbicide by the brand name Round Up. - Direct application of this herbicide only. The Trail Maintenance Task Force Chair, Brook McDonald, recommends low pressure spray application, low pressure sponge application or swipe or wick application. Of these three methods we would recommend the swipe or wick method. - Responsible trimming of trees along power lines that leaves the trees healthy and aesthetically pleasing. As Mr. Butler pointed out there is no official agreement on this issue despite the claims in Chairman Schillerstrom�s June 22 press release of a deal between the county and Com Ed. We hope that Com Ed will adopt the recommendations of the Trail Maintenance Task Force and implement these recommendations as policy. We would also like to thank County Board Members Rita Gonzalez and Dirk Enger for their efforts in this matter. DuPage County Board Member Rita Gonzalez is a LEADER! She is leading the efforts to protect the trees, trails and trailusers including the wildlife. with the IL Commerce Commission. Rita Gonzalez, Board Member of the DuPage County Board serving District 1 announced today her continued concerns about the poor tree maintenance performed by Commonwealth Edison (Com Ed) and its contractor Asplundh along private property and the trails in <?xml:namespace prefix = st1 ns = "urn:schemas-microsoft-com:office:smarttags" />DuPage County. See the official complaint below filed on 7/7/09. Have you been in contact with the Utility? Yes, I have contacted the utility. DuPage County and its nearly one million residents have suffered long enough from Com Ed�s butchering of the trees along the trails owned by the taxpayers and along or in private property. Citizens in my district which includes the communities and townships of Addison, Bloomingdale, York , Elmhurst , Bensenville, Lombard, Roselle , Schaumburg, Itasca, Wood Dale, Villa Park, Medinah and Elk Grove and many others across DuPage County are fed up with the continued damage to their trees and trees in the public right-of-way by Com Ed and its contractor Asplundh. Com Ed�s contractor (Asplundh) has chopped the tops off trees leaving no branches to grow instead of trimming them in a healthy manner as required by state regulations. I am asking the ICC to investigate this matter and hold a public hearing in DuPage County on an evening to allow its hard working citizens to attend. This is a serious matter. I have heard from citizens in District 1 and trail supporters from across DuPage County that wants this damage to the trees and their property values to stop. The ICC has the power to stop this damage and plans by Com Ed to wipe out all the trees and bushes along mile long stretches of both the IL Prairie Path and Great Western Trail and use herbicides to stop them from growing. These plans are extreme and the planned use of herbicides across such a large area of heavily populated and used trails is unprecedented. We need the ICC to ensure the public�s health and best interests are protected before any trees, bushes and wildlife habitats are removed and sprayed with herbicides. Click on the photo for a news article in the Chicago Tribune 7/1/09 with more info about proposed ideas to solve this terrible problem with trees being chopped by Com Ed. DuPage County Board Chairman Robert Schillerstrom issued a statement (copy attached) Monday saying ComEd had agreed to remove the stumps and any debris left behind from the trimming and replace the trees with new flora that won't grow as tall. But that's news to ComEd. See the news article in the Daily Herald on the right by clicking the photo to find out the rest of the story. Several thousand trees have been chopped along the IPP and GWT in DuPage County instead of trimmed by Com Ed's contractor Asplundh. Click on photo to get the news article from the 6/24 Daily Herald. In addition to the ongoing concerns and efforts to stop Com Ed from chopping the tops off trees instead of trimming them (see the photo above) Com Ed now wants to begin spraying HERBICIDES to kill the trees, bushes and wildlife along the trails. I am writing you to express my concern regarding the possible use of herbicides along the Illinois Prairie Path and Great Western Trail in DuPage County. As a resident of the Fox Valley area, I know how vulnerable the electrical supply has become, because of overgrown trees. ComEd has to reduce the likelihood of power disruption, following storm activity. However, the use of herbicides may be an instrument that is too blunt or broad for children and women of childbearing age. My primary concern is for the patients and young families that I have seen in my private practice in Naperville. The patients and families have been affected by several neurogenic problems (e.g., autism, attention deficit hyperactivity disorder, Asperger syndrome and receptive-expressive language disorder). These problems have been associated with several speech-language and hearing difficulties. My cases have been medically complex, with many unknown causes or syndromes. Evidence has been growing to show a definitive empirical or experimental link between autism and certain known toxic components, such as mercury and lead. And it has become clearer that environmental factors may be associated with autism spectrum disorder (ASD) at the cellular level. The susceptibility of mercury and lead poisoning and ASD has remained a concern in the medical community. We may have an answers to questions, with respect to links between environmental toxins and autism, birth defects in the future. One has not needed a basic understanding of neurobiology to comprehend the lessons that history has taught us on quick fixes. As such, I am asking your support in opposing the use of herbicides along the Prairie Path and Great Western Trail, which have been shared by very young children, expectant mothers, runners, walkers and bicyclists like me. Dr. Willard C. Hooks, Jr. THANK YOU Dr. Hooks! And we need you to speak up too. An open letter to the Board members of DuPage County, Commissioners of the Forest Preserve District of DuPage County and IL legislators serving DuPage County. Letter to the DuPage County Board, Forest Preserve District of DuPage County and IL legislators serving DuPage County regarding Commonwealth Edison�s continued butchering of the trees and plans to spray herbicides along both the Great Western Trail and IL Prairie Path. <?xml:namespace prefix = o ns = "urn:schemas-microsoft-com:office:office" /> As a long time trail user, volunteer and participant in different trail and environmental groups, I have seen the continued destruction of the natural beauty of our trees and trails. Because of the concerns of trail users and neighbors a meeting was held on May 19th at the DuPage County Administrative Building. At this meeting the concerns about the tree chopping or butchering were discussed. Commonwealth Edison (Com Ed) was in attendance and made a power point presentation to the group. In the presentation to answer our concerns Com Ed detailed plans to remove all the trees and bushes in three long sections of the Great Western Trail and IL Prairie Path to start. In addition, they plan to spray herbicides to kill these trees and bushes. In the presentation which they will not give copies of it despite promises from Com Ed and an employee of DuPage County that we could get a copy, they showed photos of ATVs with large tanks and aerial (5�+ off the ground) sprayers to be used for the spraying of the herbicides. And they did not offer any plans for replacing the many hundreds of stumps of dead trees left over from their chopping the tops off trees when they should be trimming them in a healthy manner as required by the IL Commerce Commission. Why do our elected officials allow Com Ed and their contractors to continue to destroy our trees (many along and in private property too) and trails? Millions of dollars are given to Com Ed by the government agencies that you control every year. Alternatives are available to Com Ed for electric power. Other government agencies and municipalities much smaller than DuPage County with nearly one million people have mandated and enforced the healthy trimming of trees by Com Ed as part of their contract to purchase electric power. Why do you allow Com Ed to get away with these destructive tree maintenance practices every year? What steps have you taken to consider and propose alternatives to purchasing all your electric power from Com Ed? What elected officials will lead and when to mandate that the healthy trimming of trees is followed in DuPage County and everywhere else in the State of Illinois? Consider that Com Ed feels they have such an upper hand to even refuse to give out copies of a presentation they made on May 19th to DuPage County and its� citizens. Who will begin to make them accountable for their actions? Please remember that Com Ed is saying they are trimming the trees in a "healthy manner using licensed professionals, etc." And they say that with a straight face. Now they are saying they will spray the herbicides in a "healthy manner using licensed professionals, etc." So if they spray the herbicides like they �trim the trees� we are all in big trouble unless you help us. Public officials and the public are speaking out to protect the trees, trails and trailusers including wildlife in DuPage County. We need you to speak out too! to protect the trees and trails. Dirk Enger, member of the DuPage County Board serving District 6 attended the rally on June 20th sponsored by the Bloomingdale Township Democratic Organization at the Great Western Trail at <?xml:namespace prefix = st1 ns = "urn:schemas-microsoft-com:office:smarttags" />Schmale Rd in Carol Stream, IL to protest the continued butchering of the trees and planned spraying of herbicides along the IL Prairie Path and Great Western Trail. At the rally he stated that he is concerned about the continued destruction of the natural beauty of our trails by the chopping off the tops of the trees by Commonwealth Edison�s contractor Asplundh. On Monday 6/8/09 Rita Gonzalez a member of the DuPage County Board serving District 1 released her press release (copied below) about the trees being chopped instead of trimmed along the trails and plans to spray herbicides to kill trees, bushes and wildlife. On Monday morning she toured a section of the IL Prairie Path in Glen Ellyn between Longfellow on the east and Bryant St on the west. She met with representatives of the press along with members of the Friends of the Great Western Trails, IL Prairie Path not-for-profit corporation and related groups along with concerned trail users and neighbors. Rita Gonzalez, Board Member of the DuPage County Board serving District 1 and a long time supporter of the trails announced today her concerns about the poor tree maintenance along the trails in DuPage County. state levels to support a similar resolution. Let us know what happens so we may pass it along to others! Click on W to read a press release and resolution from the Bloomingdale Township Democratic Organization supporting the trees, trail and trailusers including the wildlife in DuPage County. Click on pdf logo to read the resolution from the Downers Grove Township Democratic Organization supporting the trees, trails and trailusers including wildlife in DuPage County. Winfield Township is one of the first areas where Com Ed wants to remove all trees and bushes along the GWT between County Farm and Prince Crossing Roads. In addition they plan to spray herbicides along this mile long stretch to be sure the trees and bushes do not grow back. Click on W to get the statement from the Winfield Township Democratic Organization. More groups are speaking out in favor of protecting the trees, trails and trail users including the wildlife each week! 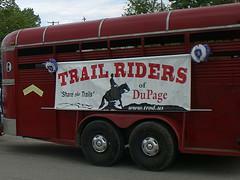 The DuPage Democratic Club and their President Bob Wagner have been long time supporters of the trails. See the recent statement with a request to contact our eleceted officials to support the trails. And now Commonwealth Edison wants to use HERBICIDES along the trails to kill off trees and bushes. 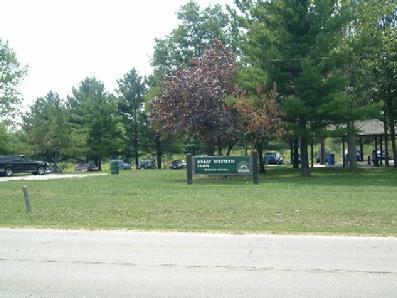 Commonwealth Edison�s tree cutting contractor Asplundh has done considerable damage to the trees on the trails (IL Prairie Path & Great Western Trails) and along private property too. Many trail users and neighbors have complained about their practice to cut the tops off the trees instead of trimming the branches. �When you top off hardwood trees, you are killing them from the top. Many dozens of trees have just been topped off as far as 20 feet below their power lines along the IL Prairie Path and Great Western Trails. This butchering of the trees takes away from the beauty and the natural feel of our trails.� stated Don Kirchenberg, Voluntary Chairman of the Friends of the Great Western Trails. On May 19, 2009 at a meeting at the DuPage County Admin. Building Com Ed announced plans to use herbicides along the trails and homes of thousands to kill trees and bushes along both the IL Prairie Path and Great Western Trail in DuPage County. <?xml:namespace prefix = o ns = "urn:schemas-microsoft-com:office:office" /> WARNING! Concerned citizens are encouraged to contact their state legislators and county officials to voice their opinions about the tree chopping directed by Commonwealth Edison. The state of Illinois has jurisdiction over the tree maintenance practices of all power companies. They can legislate better tree maintenance that will help protect the trees on the trails and anywhere near power lines. kill the trees and bushes along the trails. Note in 2002 thanks to the support of environmentalists and trail supporters from the area we were able to stop similar plans to use herbicides and remove all the trees under or near power lines along both the Great Western Trails and IL Prairie Path. We can win this fight AGAIN with everyone's continued support! PLEASE PASS ALONG COPIES OF THIS MESSAGE. CLICK ON THE W BELOW TO GET A COPY OF THIS FLYER! UPDATED FLYER NOW AVAILABLE! >On May 19, 2009 at a meeting at the DuPage County Admin. Building Com Ed announced plans to use herbicides along the trails and homes of thousands to kill trees and bushes along both the IL Prairie Path and Great Western Trail in DuPage County. Click here for more info. CONGRTULATIONS to the citizens that won the battle to protect our environment including our Danada forest preserve and the air we breathe! The CAC is an important asset to our communities. Click on the logo to visit their site. The West Chicago Prairie on the Geneva Spur along the IPP is a special location to visit. Double click on photo to get more info. In addition, this section of the trail and prairie is now being targeted by Com Ed to kill off the trees and bushes along the IPP and spray herbicides too. The paths lead through Wheaton and Glen Ellyn. Gonzalez said that ComEd's contractor, Asplundh "is chopping the tops off trees, leaving no branches to grow instead of trimming them in a healthy manner as required by state regulations." In a phone interview with The Sun, Gonzalez said she has spoken about the issue with various groups interested in the Prairie Path and the Great Western Trail, including Friends of the Great Western Trail, garden clubs and other not-for-profit groups. She said many perceive a problem, especially along an area of the path near Longfellow and Bryant avenues in Glen Ellyn. "I realize the utility company has to keep the power lines free, but we're not talking about removing just a few leaves or branches," Gonzalez said. "There are places where people have told me as much as 30 feet of limbs have been removed, and while these areas may bud with leaves, the groups I've spoken with say they are never going to grow back (fully)." Gonzalez also said she has learned that a planned herbicide program has been announced which raises concerns among residents as well. "We believe the herbicide treatment might be harmful to the plants and wildlife in the area," Gonzalez said. "We also have concerns about the effect on the water system. I serve on the Environmental Committee (of the County Board), which is one of my responsibilities, and we are calling for ComEd to follow ... regulations." Peter Pedraza, a spokesman for ComEd, said that the company "remains committed to the wooded areas in the community" and that the company must continue "to strike a balance between maintaining the public safety and the reliability of the transmission lines." "Some people may recall the blackout issues back in 2003 on the East Coast which were all created by problems due to trees," Pedraza said. "We follow regulations, plus the area in question there is governed by both state and federal agencies." Pedraza said the utility company met May 19 with the DuPage County Board to present its proposals for the area and that ComEd officials "are looking forward to continuing discussions and reaching agreement about performing work in the area." "We have highlighted the restoration of plants and we look forward to more discussion with the county to resolve this issue as soon as possible," he said. Regarding the herbicide issue, Gonzalez said she was awaiting receipt of a video which would explain the program. Podraza said the herbicide program would involve only three specific areas, one on the Prairie Path and two on the Great Western Trail, and that the application would be performed exclusively by licensed professionals. "We don't use products that are formulated specifically for ComEd," he said. "They all conform to the required regulations." Note the news article is incorrect because Rita Gonzalez is concerned about all the trees and bushes along all the trails. The area on the IPP between Longfellow and Bryant was visited to see a sample of the damage done by Com Ed's contractor (Asplundh) on all the trails in DuPage County. >IL Prairie Path is now OPEN between Glen Ellyn & Lombard from Hill Ave on the west and Vance Ave on the east. >Section of Fox River Trail closed on the Fox River Trail, the bridge at Raymond Street between the Elgin branch of the Prairie Path and Moody Court will remain closed indefinitely. The bridge was damaged during extreme flooding Sept. 13-14. District staff is working to determine structural integrity of the bridge and trail, and how best to make repairs. For more information, call the Kane County Forest Preserve District at (630) 232-5980. They say "when lightning roars go indoors." Be careful on the trails and anywhere else outside. The IL Railway Museum is a fun place to visit tied to the rails-to-trails history. Volunteers Lonnie Morris and Bob Wagner cutting teasel weeds along the GWT in Villa Park. Send us your photos of efforts to restore the natural beauty of the trails. The GWT's eastern trailhead in Villa Park has been improved with many amenities. Double click on the drawing to go to the website detailing this area. Double click on photo to see more of Ed Foster's photos and notes from rides along the GWTs. The Great Western Trail section that runs 18 miles from St. Charles to Sycamore starts in St Charles, IL at the Leroy Oakes forest preserve. It originally was a rail right-of-way part of the Great Western Rail Line and built by the Minnesota and Northwestern Railroad in 1886. The trail is flat and you roll through the countryside past numerous small streams and wetlands. Continuous wild shrubs include Dogwood, Blackberry, and Hazelnut and merge with a few remaining patches of native prairies. 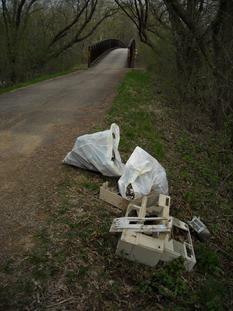 This trash and more was picked up along the GWT in Kane County by Tom Bloore. THANKS Tom! The GWTs volunteers do a tremendous job. Thanks to all for their help! Be careful when cleaning up the trails. See the suggestions listed below to follow when cleaning up the trails. 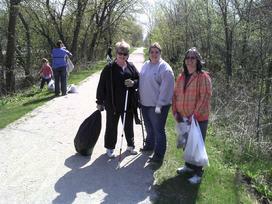 conducted its annual trails cleanup on Saturday, April 25. Tom Bloore and Kim Girard. extra items picked up during the cleanup. cleanup that included bicycle checkups and supplies for the cleanup volunteers. other groups.� concluded Don Kirchenberg. with you on the trails. CARA helps all types of runners and many communities. Click on logo for more info about their programs and the races they support. Click on PDF logo for information about a race on the GWT in Kane County that will benefit a worthwhile charity. Let us know of races and events scheduled on the GWTs so we may help publicize them. THE TRAIL IS BUILT ON THE ORIGINAL RIGHT-OF-WAY OF THE GREAT WESTERN RAILWAY. Click on logo to get more history and another website about the railway. A scanned file of a map of the GWTs in IL. Open and print to use on the trails. Enjoy the many miles of the GWTs in IL from Villa Park to West Chicago and from St Charles to Sycamore. Click on logo to find out more about this group that helps trails everywhere. Hard working trail cleanup volunteers from the Elmhurst Bicycle Club. Click on photo to find their website. We all say we want to drive less and live more but how do we do it? Find out how to get to where you want without driving or by driving less using multi-modal options including bicycling and walking. Click on the logo to learn more. Kane County, Illinois has a significant network of existing regional bicycle trails and many shorter local trails. Local residents realize that using the Kane County trail network is healthy, an inexpensive hobby, environmentally friendly and fun way to travel. Now there is also the ability to bring your bikes on transit. Click on the PDF logo to learn more. And to drive less try the new GOROO site linked on the left. In Kane County, Illinois the Great Western Trail and most others are managed by the Kane County Forest Preserve District. Click on the logo to learn more and how you may volunteer to help the trails and forest preserves. 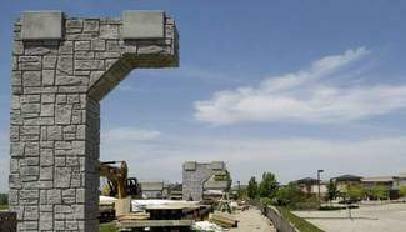 New bridge to link trails in Kane County. Construction on the $2.5 million overpass at Randall and Silver Glen roads in South Elgin began earlier this year and is scheduled to wrap up by Thanksgiving, 2009. Thank you to Kane County and the St Charles Park District for their efforts to make trail use safer. Horsing around on the GWT in DuPage County is encouraged! Include time, place and names too. 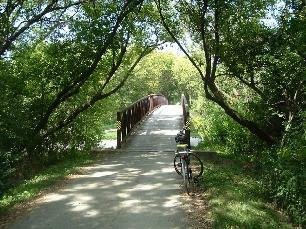 In Kane County trail users enjoy shaded areas and the trees providing the trails with more natural beauty. Chicago Tribune, October 2, 1963.
getting the rails-to-trails movement started. We are human beings. We are able to walk upright on two feet. We need a footpath. Right now there is a chance for Chicago and its suburbs to have a footpath, a long one. The right-of-way of the Aurora electric road lies waiting. If we have courage and foresight, such as made possible the Long Trail in Vermont and the Appalachian Trail from Maine to Georgia, and the network of public footpaths in Britain, then we can create from this strip a proud resource. Look ahead some years into the future. Imagine yourself going for a walk on an autumn day. Choose some part of the famed Illinois footpath. Where the highway crosses it, you enter over a stile. The path lies ahead, curving around a hawthorn tree, then proceeding under the shade of a forest of sugar maple trees, dipping into a hollow with ferns, then skirting a thicket of wild plum, to straighten out for a long stretch of prairie, tall grass prairie, with big blue stem and blazing star and silphium and goldenrod. You must go over a stile again, to cross a highway to another stile. This section is different. The grass is cut and garden flowers bloom in great beds. This part, you may learn, is maintained by the Chicago Horticultural Society. Beyond the garden you enter a forest again, maintained by the Morton Arboretum. At its edge begins a long stretch of water with mud banks, maintained for water birds and waders, by the Chicago Ornithological Society. You notice an abundance of red-fruited shrubs. The birds have the Audubon Societies to thank for those. You rest on one of the stout benches provided by the Prairie Club, beside a thicket of wild crab apple trees planted by the Garden Club of Illinois. Then you walk through prairie again. Four Boy Scouts pass. They are hiking the entire length of the trail. This fulfills a requirement for some merit badge. A troop of Scouts is planting acorns in a grove of cottonwood trees. 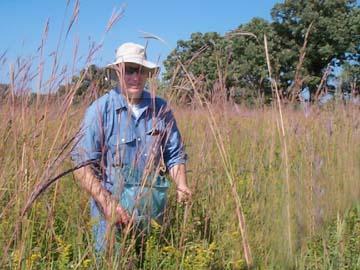 Most of the time you find yourself in prairie or woodland of native Illinois plants. These stretches of trail need little or no upkeep. 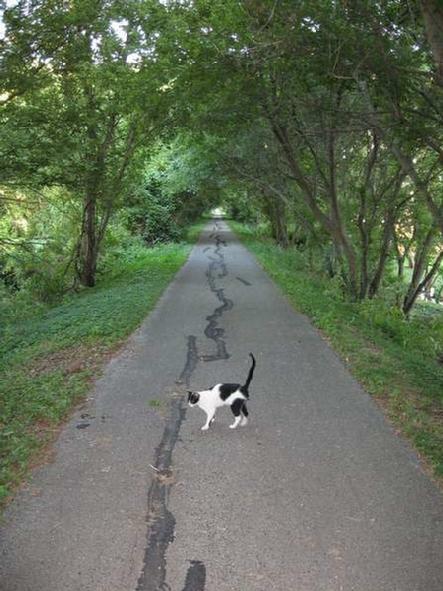 You come to one stretch, a long stretch, where nothing at all has been done. But university students are identifying and listing plants. The University of Chicago ecology department is in charge of this strip. They are watching to see what time and nature will do. You catch occasional glimpses of bicycles flying past, along one side. The bicycles entered through a special stile admitting them to the bicycle strip. They cannot enter the path where you walk, but they can ride far and fast without being endangered by cars, and without endangering those who walk. That is all in the future, the possible future. Right now the right-of-way lies waiting, and many hands are itching for it. Many bulldozers are drooling. 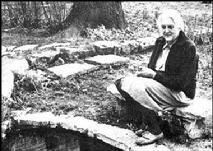 May Watts was a visionary, teacher and author. Click on photo for more info. about this special person. Photograph by George Zahrobsky, 1965 (Morton Arboretum). Click on photo to learn more about May Watts. A good quick reading white paper on our landscapes and what we are doing to them. Click on logo to learn about the EL&PC the Midwest�s leading public interest environmental legal advocacy and eco-business innovation organization. Many environmental education programs are available for schools and groups operated by SCARCE. Click on logo to go to their website. Click on logo to learn more about options and suppliers for renewable energy. 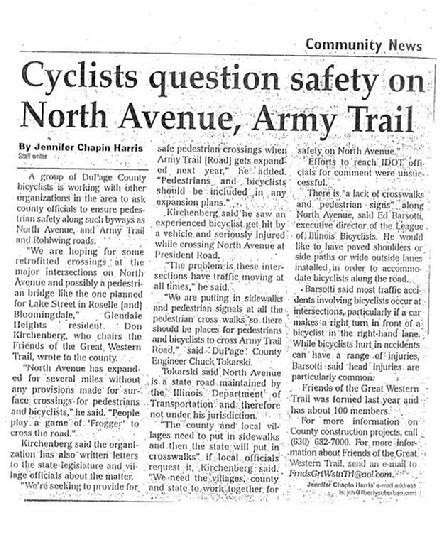 The Friends of the Great Western Trails started officially in 2000 and the Daily Herald featured our efforts on the front page! Click on photo for info on helping kids get healthy with activities and a better diet. 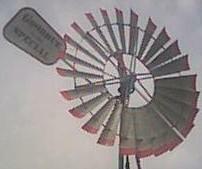 In 2002 former U.S. Surgeon General David Satcher asked America to address the burgeoning crisis of childhood overweight and obesity, and Action for Healthy Kids was formed in response. While residents this week said two makeshift shacks illegally built along a portion of the Great Western Trail in Carol Stream have been removed, the issue of illegal dumping and partying in the trails remains a big concern. One trail advocate is calling on the village of Carol Stream and the DuPage County Board to do more to address the problems along the trail, which he claims is in the worst condition he has ever seen. Don Kirchenberg, chairman of the Friends of the Great Western Trail, called on the Carol Stream Village Board this week to allow local police to assist in patrolling the trails. The trails are now patrolled by the DuPage County Sheriff�s Department. Kirchenberg issued a statement to the board at their meeting Monday night. Carol Stream Mayor Frank Saverino said the county is responsible for those patrols. He said much of the area in question is unincorporated and in portions of Glendale Heights, not in Carol Stream, and the village does not have the resources to patrol areas not in the village. �We don�t have the manpower to be doing that,� he said. Advocates of the Great Western Trail said on Monday that the two shacks, discovered earlier this year and used either by homeless people or by teenagers for �party houses,� were taken down sometime after Friday by the DuPage County Sheriff�s Police, officials said. Kirchenberg said other debris still remaining from �party sites� has not been cleaned up. Beer bottles and other debris still remain in several portions along the trail, Kirchenberg said. Kirchenberg also claims the county still needs to do more to patrol the Great Western Trail to crack down on illegal activity and dumping on trail property. The issue was brought to light by DuPage County Board candidate Richard Dunn, who held a press conference at the site of the shacks on April 8. Dunn, a Democrat, is running against Republican incumbents Grant Eckhoff and Debra Olson for one of the District 4 seats on the DuPage County Board. Dunn said he believes the county should be doing more to prevent dumping and illegal activities on the Great Western Trail. Eckhoff maintains the county is doing all it can, and that it relies on residents to report activity in the trails and forest preserve areas. Thank you to trail neighbors and Richard Dunn! Official statement to the Village of Carol Stream regarding DANGEROUS CONDITIONS on the GWT. 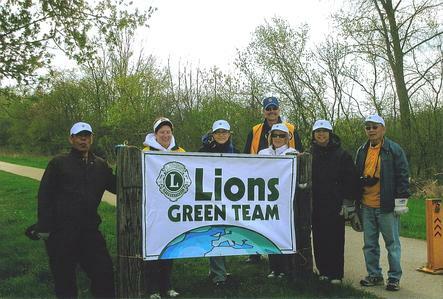 The Lions Club volunteers will be back to help clean the GWT. We welcome your support year around to keep the trails clean. Click on the photo to learn more about this great group. A plan to make our region less congested for all residents. 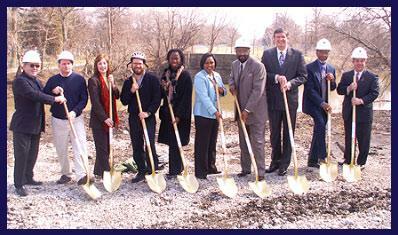 On March 10, 2006 - Dignitaries gather for a ground-breaking ceremony marking the beginning of construction for a new pedestrian bridge along the Des Plaines River. 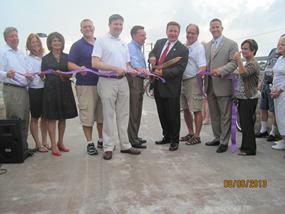 Pictured above (l to r) are: Don Kirchenberg, President Illinois Prairie Path; Paul Aeschlemann, former IPP President; Sue Mondry, owner of Legal Grounds Coffee; Bob Sadowski, executive director of Chicagoland Bicycle Federation; Carole Brown, CTA Board Chairman; State Representative Karen Yarbrough; 28th Ward Alderman Ed Smith; IDOT Secretary Timothy Martin; Maywood Mayor Henderson Yarbrough; and Forest Park Mayor Anthony Calderone. for technical content, meetups and legal/political awareness. The Great Western Trail is a rail trail in Illinois. It occupies two non-contiguous sections of an abandoned Chicago Great Western Railway corridor in suburban Chicago that have been converted into biking and hiking trails. The western-most, and older, section of the Great Western Trail is located between western St. Charles in Kane County and eastern Sycamore in DeKalb County. This section was right-of-way that was abandoned in 1977. The eighteen-mile crushed-stone path traverses unincorporated rural townships, natural wetlands, some restored prairies, and farmland. Eastern section of the Great Western Trail at Prince Crossing in West Chicago, at the western terminus. The newer of the two sections, between Villa Park and West Chicago in DuPage County, is made up of right-of-way that was abandoned piecemeal throughout the 1980s and early 1990s. As the railway was abandoned, the government of DuPage County made upgrades to the path, and between 1990 through 1992, the trail was converted from a rail grade to a bicycle trail. The twelve-mile crushed stone path crosses some farmland and suburban areas. At the east end of the trail is a restored former CGW depot building. The Great Western trail also was extended to make a connection with the Illinois Prairie Path in 1995. In 1998, a new bridge was built over Interstate 355, while the next year, a new bridge was built over the West Branch of the DuPage River. to saving the planet, McKeen is our �go-to� person. including Mayor Gayle Smolinski � listened to McKeen. She delivered the identical message to three other groups that day. Wheaton�s first recycling event. The tradition continues. clubs volunteered to accept the spectacles. his fellow Lions will clear debris from their assigned section of the trail. community and a healthier planet. CALL 911 whenever you see problems or illegal activities. Pets must be leashed and you must clean up after them. No motorized vehicles are allowed. Power-assisted wheelchairs are allowed. No firearms, kites, or model airplanes. No alcoholic beverages or controlled substances. Cyclists and equestrians should give an audible warning when overtaking another user by calling out 'passing on the left'. Users should make an effort to stay to the right when traveling the trails. Cyclists should not travel at excessive speeds. Care should be given when approaching horses to avoid "spooking" them. Cyclists (really all users) should stay on the surfaced portion of the trails. Cyclists should wear helmets at all times. There are trash containers at many intersections - please use them. Camping is not allowed on the trails. The trails are cleaned year around by volunteers. Your help in keeping the trails clean is appreciated. with you on the trails. Thanks. email frndsgrtwstntrl@aol.com or call 630-853-7650. Click on flag for a great website including trail and bike info. Thank you to Mike Bentley! Click here to learn more about a group that helps everyone on the roads and trails! New name for the Chicagoland Bicycle Federation. Click on the link to learn more. 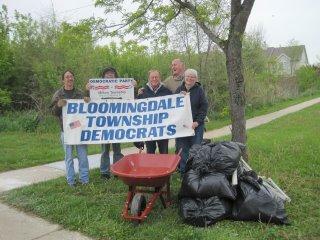 Hard working volunteers from the Bloomingdale Township Democratic Organization after filling over 50 bags and three shopping carts of trash from illegal party sites and litter between Schmale and Bloomingdale Roads on the GWT! Please submit your photos of the GWTs like this one of the GWT in Kane County. Send them to email address: frndsgrtwstntrl@aol.com Include names or any info to help us use the photos. Important work on the national and local level to protect and improve the environment. Click on logo for more info. The GWT is part of the Grand IL Trail. The Grand Illinois Trail (GIT) is a 535-mile loop trail in northern Illinois. It goes from Lake Michigan to the Mississippi along the northern border of Illinois and then loops back across the state along the Illinois River and the Hennepin Canal. 200 miles of the route is on paved township and county roads while the rest is on limestone trails or paths. The GWT in IOWA is enjoyable because of the beautiful rural setting. Click on the logo for more info. 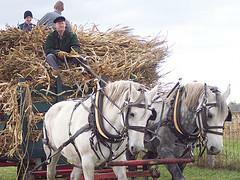 Kline Creek Farm is operated by the DuPage County Forest Preserve District just south of the GWT on County Farm Road and just north of the IPP's Elgin Branch too. It offers free parking and a great spot to begin your trip on the GWT in DuPage County. Click on photo for more photos. Do you like the ideas of supporting family owned and operated farms? Click on logo for more info. turned into a dumping ground! the Des Plaines River at the Miller Meadow Forest Preserve. vegetation, toward the nearby Des Plaines River. on the restoration of Miller Meadow through the Freedom of Information Act. prevalent or representative of the area." Mayberry said the agency has received a "favorable report"
no violations, said state EPA spokeswoman Maggie Carson. dangerous" for people who want to use the area for recreation. site has carried debris and biosolids toward the river banks. I think that's a problem," Dye said. a lodge of sticks along the muddy river bank, Cox said. the Board of Forest Preserve Commissioners. acquired "by and for all the millions of Cook County citizens." but has been extended several times, according to documents. company first arrived to restore what he called "a barren wasteland." "It was an absolutely blighted site, nothing could grow there,"
Davies said. "We brought in dirt and top soil and vegetated it." with Earthwerks to prevent further erosion. the Water Reclamation District, Mayberry said. restoration at Miller Meadow is nearly complete, he said. the people who were supposed to protect it," she said. best possible quality of life for all. you can do. And aim high! DIRECTIONS: From I55: Look for exit 241, Wilmington. the right or east side of the highway. 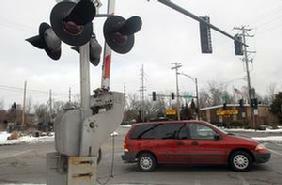 NOTICE: 2 pedestrians have died attempting to cross the newly expanded North Ave in DuPage County. Click on news article to go to webpage http://saferoadways.net/ for more info. You are welcome to add our website WWW.FRIENDSOFTHEGREATWESTERNTRAILS.COM to your website or post it in newsletters, etc. The fight to permanently save over 350 very old trees goes on. Click on photo to go to their site. Thank you to Maximum Printing of Downers Grove, IL for their assistance, for 2 consecutive years, with the printing of the trail cleanup flyers. Thank you to Eagle Scout Michael Aldas, his volunteers, Boy Scout Troop 22 leaders including Terry Jones and Steve Sullivan. And thank you to Ray Ribich for his leadership in helping protect the historic St Stephen's cemetery and adjacent original prairie remnant. There is a historic site along the GWT in DuPage County. ALSO CHECK THE OTHER WEB PAGES and links featured around this website. did the world learn that James Phillips, 70, was the man known as "The Fox." ashes into the Fox River and broke his canoe paddle in tribute. that I'm writing the rules to suit me and not them, I'll be caught." He never was. From the Chicago Wilderness magazine Winter 2002 issue. Forest Preserve of DuPage County. Here is one the news articles that helped the cause. Glacial Ridge natural area, a remnant of one of the largest kames in DuPage County. unprotected piece of original vegetation in the county," states Armstrong. unseen for over 100 years." Lives of young and old can be saved by AEDs. Click on the logo to learn more. Know of websites and groups that would be of interest to trail users and environmentalists? Send us an email to Frndsgrtwstntrl@aol.com to let us know. What is your actual "carbon footprint"? Click on the logo to get to the carbon footprint calculator. PLEASE PASS ALONG NEWS OF THE TRAILS,THIS GROUP AND OUR ACTIVITIES. Thanks!